Viruses are commonly present in any honeybee colony. However infection of honeybees and the appearance of disease symptoms seems to depend to a large extent on other stress factors on the colony, such as lack of space, food or water, weather or infection by other means be they bacterial, fungal or mite. Certain viruses can cause dramatic paralysis of adult bees, especially Acute Paralysis Virus (APV) and Chronic Paralysis Virus (CPV). Signs of paralysis include dark and shiny adult bees at or near the hive entrance that are unable to fly. They may be seen crawling and trembling in large numbers on nearby foliage. The wings are usually dislocated and spread out from the body in an unnatural posture and the abdomen can also be swollen. Accurate diagnosis of viral diseases in honeybees is often not straightforward. Seemingly healthy colonies can succumb alarmingly quickly when other trigger stress factors such as varroa mite infestation appear. For example, APV or CPV may appear in the middle of a good summer season when varroa mite levels are at their highest. Honeybee colonies can exhibit many symptoms simultaneously, a phenomena collectively called Parasitic Mite Syndrome (PMS). Varroa mite infestation is always associated with PMS, which is also characterised by diseased bee brood, infected with one or several types of virus. PMS in bee brood may at first be confused with European foulbrood (EFB) with the larvae dying stretched or curled in their cells. When pressed with a matchstick the cadaver is globular, as in EFB. Yet laboratory analysis show that these symptoms are virus/es rather than foulbrood bacteria. There are many viral agents of disease in honeybees. Some of the more common ones include sacbrood virus, Deformed Wing Virus (DWV), Cloudy Wing Virus and Kashmir Bee Virus. At present there are no available treatments against honeybee viruses. However, Vita is researching how to limit virus infection. 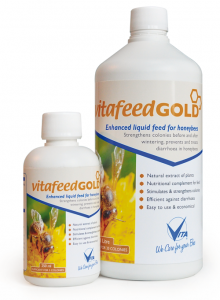 Keeping colonies healthy and strong reduces the risks, VitaFeed Gold can help. Good beekeeping and timely treatment of other pests and diseases can help to subdue virus activity. Viruses and varroa mites are often a deadly combination, but if varroa numbers are controlled, the risks decrease. In particular, varroa mites are a vector of Deformed Wing Virus so effective control of varroa (with Apistan or Apiguard, for example) will help limit this viral infection.